Animated STAR TREK - "The Terratin Incident"
While exploring a burnt-out supernova, the U.S.S. Enterprise finds a miniature city called Terratin, and soon discover that it is a lost Earth colony that has mutated because of the supernova's radiation and that the Enterprise crew is beginning to shrink also. PSA epilogue for "The Terratin Incident"
This episode's author, Paul Schneider, previously had written two episodes of the Original STAR TREK series, "Balance of Terror" and "The Squire of Gothos." There was an error in this episode. After becoming smaller, Lieutenant Arex mentions that his eyes no longer reach his station's opticals, but the navigator station has no opticals. Engineering officer Gabler, one of Scotty's best men, was seen in this episode. Along with Arex and M'Ress, Gabler was one of the new recurring characters on the animated STAR TREK series. He appeared in three episodes: "Once Upon a Planet", "The Terratin Incident" and "The Time Trap". Hal Sutherland directed this and fifteen other animated STAR TREK episodes. Sutherland, along with Norm Prescott and Lou Scheimer, founded the Filmation television production company in 1965 which mainly produced animated Saturday morning childrens television series. Sutherland acted as director on most episodes produced by Filmation from 1965-1988. He directed such classic cartoons as "Fantastic Voyage", "The Brady Kids", "The Batman/Superman Hour", "Sabrina, The Teenage Witch", "The Archies", "He-Man and the Masters of the Universe", "Lassie's Rescue Rangers", "Gilligan's Planet", "The Groovie Goolies" and "Fat Albert and the Cosby Kids." Starfleet regulations mandate that Communicators be carried by all landing party members. After beaming down to the volcanic planet's surface, Kirk's communicator is quickly dropped and covered by molten lava. 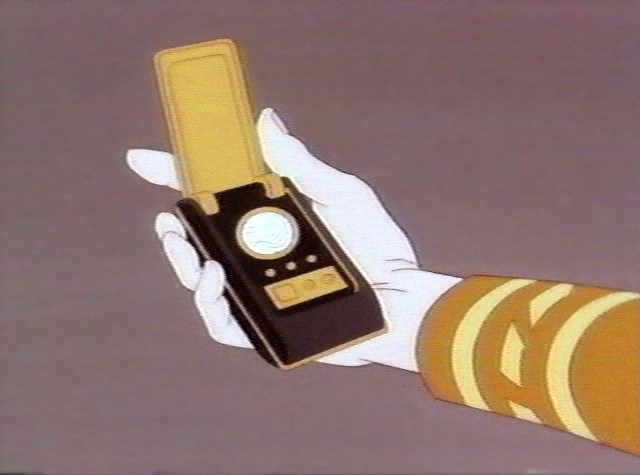 In several original STAR TREK episodes as well, the Communicators carried by landing party personnel are often taken, lost or damaged to heighten the sense of danger because there would be little dramatic tension if our heroes could too easily call for help or evacuation when danger presented itself. The dramatic volcano and molten lava effects seen in this episode would have been expensive to accomplish in live action and less-effective stock footage of lava would likely have been employed. In this episode, the Terratins turn out to be from an Earth colony ship lost 200 years ago. The concept of a starship discovering a lost Earth colony many years later is one that recurs throughout all of the STAR TREK series. In this episode, the key to restoring the crew turns out to be the ever-useful ship's transporter system. 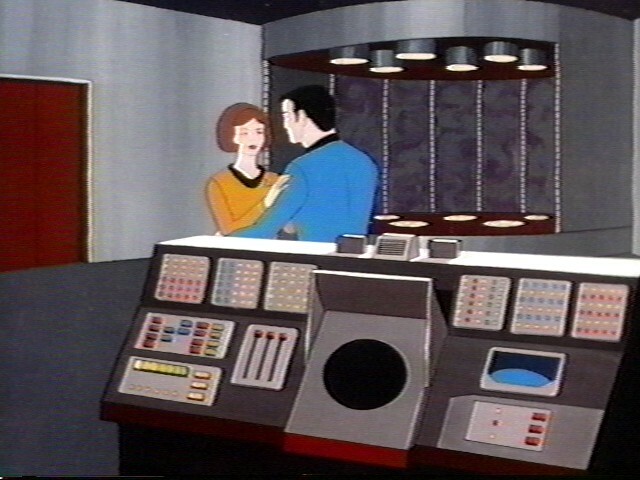 The transporter room was faithfully translated from live action to animation by the artists at Filmation Associates. This idea of some of the crew being miniaturized by some scientific phenomena, was used again in the February 1998 STAR TREK: Deep Space Nine episode "One Little Ship". There was a visual error in this episode: in one scene the bridge elevator doors were gray. 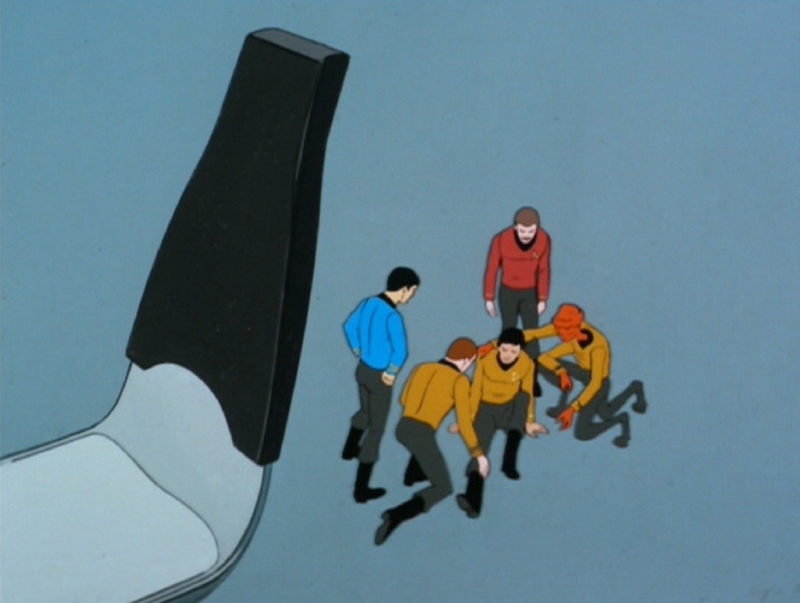 In this episode we learned that a crew of humans just larger than one centimeter (about 3/8 inch) in height could still operate the Enterprise. "The Terratin Incident" was novelized by Alan Dean Foster in Star Trek Log Four published by Ballantine Books in March 1975. Also novelized in the book was "More Tribbles, More Troubles" and "The Time Trap".